Grohowski, Joseph. 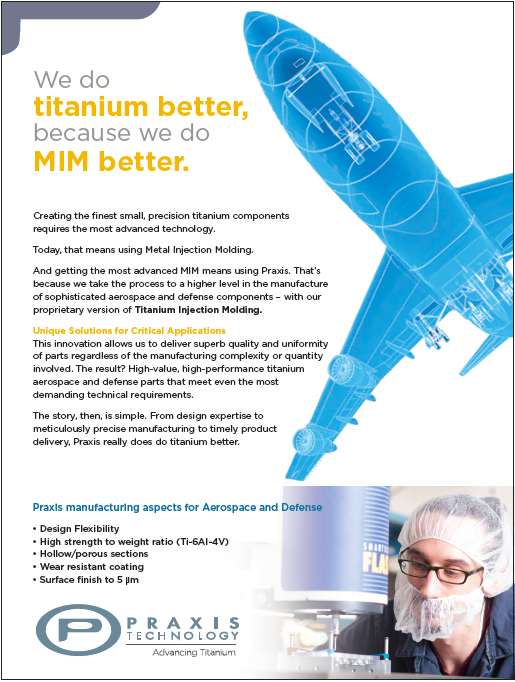 “Praxis Technology: Taking the next step in the commercialisation of high performance TiMIM alloys.” Powder Injection Moulding International Vol 10. No. 2 (2016): 63-69. Web. Piemme, Jobe. “Metal Injection Molding for Implantable Device Applications”. International Journal of Powder Metallurgy. (2018): 21-24. Print. Grohowski, Joseph. 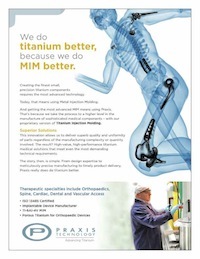 “Praxis Technology: Enhancements to Ti-MIM Processing Bring Medical Implants a Step Closer.” Powder Injection Moulding International 8.2 (2014): 59-65. Web. Kelin, Jeff. “Enabling New Age Knees.” IHS Engineering 360. N.p., 21 Sept. 2104. Ebel, Thomas. 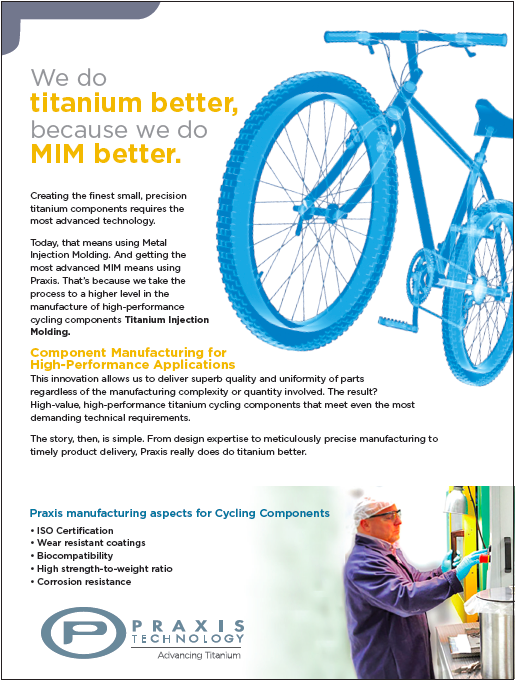 “Advances in the Metal Injection Moulding of titanium at Euro PM2014” Powder Injection Moulding International 9.1 (2015): 51-61. Ebel, Thomas, Orley M. Ferri, Wolfgang Limberg, and Frank-Peter Schimansky. “Metal Injection Moulding of Advanced Titanium Alloys.” Advances in Powder Metallurgy & Particulate Materials (2011): n. pag. Web. Bone Ingrowth of Particle Sintered Titanium Foam in a Rabbit Model.” Diss. Medical U of South Carolina in Charleston, n.d. Abstract.